I’ve complained before about a plateau that I was stuck in when I was 197lbs, but now I’m stuck again, but this time for good reason. 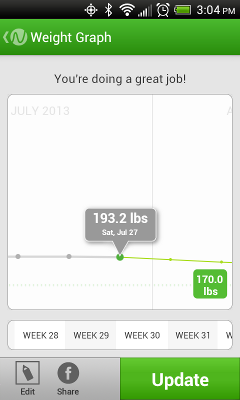 Here are my Noom weigh-in’s for July. From the July 6 weigh-in to the July 20th weigh-in, I believe the reason for the halt in weight loss is because I’ve been eating the Michelina’s frozen dinners and not the Weight Watchers Smart Ones. See, I thought that because they had the same amount of calories, fat and sodium that they would basically be the same thing, but I guess not. We recently bought 40 of those too, so when we are able to burn through those, I will start buying the Weight Watchers again. The reason we bought all those Michelina’s was because they were on sale for .50 cents each. You can’t beat those prices, especially when we were broke this month. I had no idea this was going to cause a plateau or even weight gain. I think I might have an explanation for my current week’s plateau. On July 20th, I finally started riding my bicycle again, so it has only been 1 week and I have only been out on the bike maybe 4 times, but I’m assuming that this week the reason I haven’t lost any weight is because I am gaining muscle. At least that’s what I think is going on. We have a scale which has a Weight Watchers logo on it and it can tell me my body fat, water, bone and BMI, and this week my body fat percentage went down from I believe it was 30.9 down to 29.6, so even though I am still basically the same weight, my body fat percentage has gone down and I believe it is because of the bike. So, perhaps I think that I am losing fat, but gaining muscle and we all know that muscle weighs more than fat, so therefore, the scale isn’t very helpful to me in determining my weight, but it is helpful in telling me my body fat percentage and BMI. However, my waist has gone up by 1/2 an inch. Last week it was 39.5 inches and this week it is 40 inches. I mean who really knows for sure what is going on. All I know is that I am going to continue riding the bicycle and I am going to continue to eat a proper healthy diet despite what the scale says because I know that I am going to lose fat even if I gain muscle. Gaining muscle is actually a very good thing because men who have a lot of muscle will burn more fat when they sleep, so I need to get plenty of rest, exercise and eat a proper diet and I will be on my way to losing more weight. 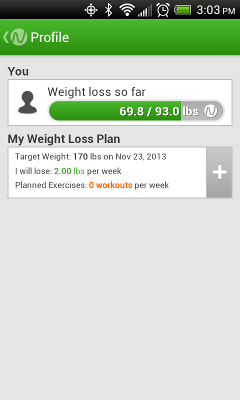 I’m not expecting that my weight will go down next week, but I hope it will. We shall see I guess. 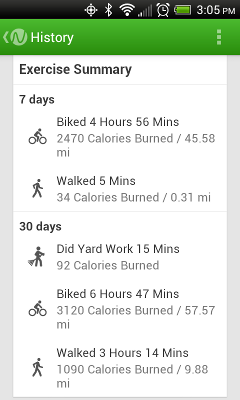 Here are my profile, weight graph and exercise summary for the week. When I was a teenager we used to go to Taco Bell and we would have about 2 or 3 tacos each and we never gained any weight. Why? Because we were fit already and we were athletic so we could eat all the tacos we wanted as long as we remained active. Although, even back then we didn’t go ALL the time, we went once in a while. Taco Bell was never my downfall. I don’t see Taco Bell as being the cause for my weight gain because during the time it took me to get fat Taco Bell was never on the menu. Every once in a while it was but it is not what made me fat and I can’t say it contributed to it either. Actually fast food was never what made me fat. It was always what I bought from the grocery store and made at home. In the 10 weeks that I’ve been on this diet we have had a no fast food policy. Although, we don’t regularly go to fast food restaurants anyway, we just figured that if we never went at all then we would be ok. I would say that in a year we would probably have maybe 4 trips to a fast food restaurant. So it’s not like I’m depriving myself of something that I never have. Today I was thinking about Taco Bells new fresco menu on the approved SparkPeople list for fast food restaurants. I looked at the calories for the fresco soft taco and it was basically the same as a regular soft taco. Well, the Fresco soft taco is 180 calories, the regular soft taco is 200 calories. It doesn’t matter if it’s beef or chicken, it’s the same amount of calories. I didn’t really want the fresco because the salsa they put on it has onions which I cannot stand. So, I chose those extra 20 calories each. I had 2 soft tacos for 400 calories and I don’t regret it at all. And if you think about it, that’s only 40 calories more than if I chose fresco. The reason I don’t regret eating 400 calories in 1 sitting is because it’s today only. I’m not going to have Taco Bell again for maybe another 6 months or maybe longer. I can’t say when we will have it again but I do know that it won’t be any time soon. If you deprive yourself of things that you like to eat then one day you will end up bingeing on it. So, it’s good to eat the things you like every so often. I’ve lost 31lbs so far and believe me, I don’t plan to gain it all back so by eating taco bell tonight and getting the craving over now will make sure that my weight loss continues. Well I’ve already started to suffer some of the side effects from these medications that the neurologist gave me for my shoulder. I’m taking Methylprednisolone 4MG Dospack 21’s which is this pack that has all the pills that you pop out the back. The first day is at the top and you have to take 6 pills in 1 day. 2 before breakfast, 1 after lunch and supper (I guess that drug company has never heard of dinner) and 2 at bedtime. Then day 2 you take 5 pills at various times throughout the day. Day 3 4 pills and so on until day 6 you are just taking 1 pill. This one is the steroid drug. Then the other one is Baclofen 10MG tablets that I have to take 3 times a day so like every 8 hours. That is a muscle relaxant drug. I read the possible side effects for both of them and some of them are similar. The muscle relaxant doesn’t have nearly as many side effects as the steroid but I’m getting quite a bit. 1 of them isn’t even listed and I’m not going to air that dirty laundry in here but believe me, it’s painful to sit down hint hint wink wink. The other ones are that my teeth don’t feel like they belong in my mouth lol. They just feel strange like the dentist shot something in there to numb them. Also I’ve got major joint aches and pains especially in my legs at the hips and well just everywhere in my legs. Let’s see, I can’t sit, I can’t stand and my teeth don’t feel like they belong in my mouth lol. What else can go wrong? Oh shoot, I just jinxed myself by saying that. One of the other side effects are that I’m hungry more which happened today, I got extra hungry, I had 2 sandwiches for lunch, not just bread but these really big rolls with 3 slices of turkey each and lettuce and mayo. Oh and we went to Hometown Buffet and I stuffed myself silly and one of the other side effects is weight gain which I guarantee you tomorrow I will see that side effect come into place thanks to the hometown buffet but we’re just gonna say it’s a side effect from the pills ok? UGH and my shoulders are experiencing joint pain too. Ok, I think I need to lay down because I’m becoming too fragile to be sitting here typing. One of my fingers might fall off and we don’t want that.